"Troy is very fun to be around and is amazing at what he does. He makes photo shoots easy and fun for everyone. He is a very talented photographer. I have gone to him for all of my pictures. I would highly recommend Memories in Focus to anyone." "Memories in Focus made my senior pictures comfortable, memorable, and fun!" "Troy is very personable and a fun guy to be around. He is a talented photographer and his work speaks for him. I have loved all of my photos and I highly recommend Memories in Focus for all of your photography needs!" "My senior portrait session with Memories in Focus was amazing. During the shoot, Troy really made it all about me and what I wanted, but also incorporated ideas of his own. With those two factors put together, the outcome was amazing, and now I love every picture I have! 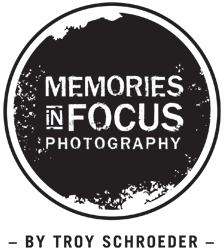 I highly recommend Memories in Focus to anyone who wants amazing pictures with a fun experience."